10th January Install Remaining Office Bearers by Installing Masters. 24th January EA Degree by Installing Masters. 14th February F.C Degree by Lodge Kenmuir 570. 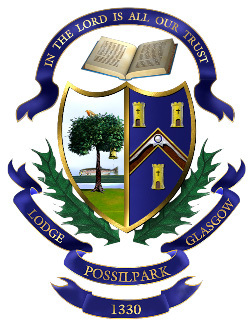 28th February Annual Provincial Visitation by Provincial Grand Lodge Of Glasgow. 14th March M.M Degree by Lodge Nitshill 1478. 28th March EA Degree by Worshipful Wardens. 11th April FC Degree byLodge Corkerhill 1426. 25th April MM Degree by Lodge Coupar O Fife 19. 9th May Lecture by P.G.L.of Glasgow History Group . 23rd May MMM Ceremony by RWMM Bro. George N Brown. 22nd August EA Degree by Reigning Masters. 12th September FC Degree by Lodge Clyde 408 . 26th September M.M Degree by Lodge Anima 1223. 10th October EA Degree by Bro. Brian Brown P.M.
24th October FC Degree by Lodge Thorntree 512. 14th November MM Degree by Lodge Ruchill 1436. 28th November Annual General Meeting by Lodge Possilpark 1330.